Currently...it is spring break! It could have not come too soon. Everyone was getting a bit ornery and tired! My hubby took his baseball team down to Disney for some baseball and fun in the sun. The rest of the family has been hanging out at home. When the hubby's away the kids will play! That usually also means we paint or redo a room. We painted my daughter's room...ran out of paint...went back for more...they are out of our paint due to a bogo sale this weekend. Don't despair...we redid the bathroom. No more fish and bright kid colors...we went yellow, tan, and white. Not finished quite yet...otherwise I would show you:) Currently though...I am linking up with Oh' Boy 4th Grade to share with you what is going on Currently! Thinking... I wanted to do so much over break...but when you lounge around and watch TV for a change...things on the list stay on the list. I am thinking...it is okay every once in a while! Mama needs a break too! Wanting... everyone around my table at Easter. We chose to have dinner on Saturday evening...right before the Wisconsin Badger game...Go Badgers! Then our older kiddos can share a dinner with their boyfriends' families, too. I am at the point that I don't care the date...I just want my family around me! 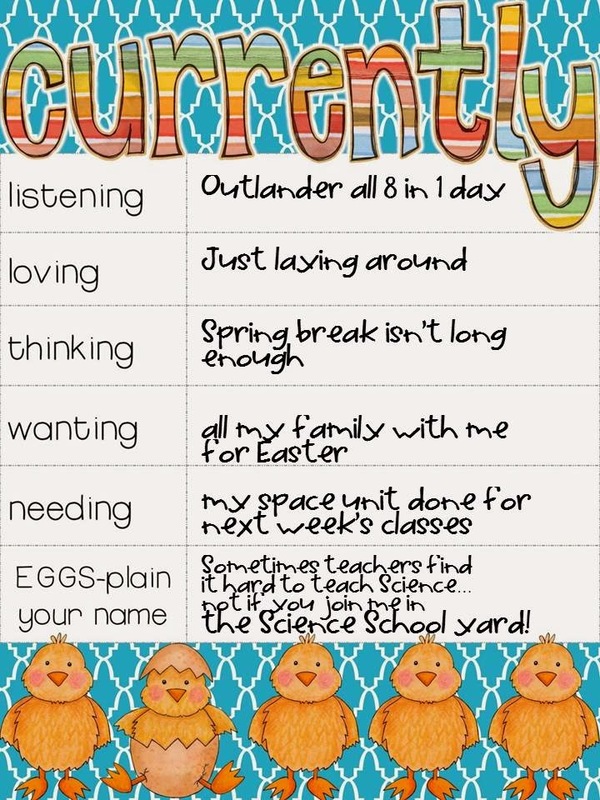 Needing...to finish up a space pack that I am working on for my 4th graders that I can use for 5th grade, too! I am almost done...just need motivation. Egg-planation of My Blog Name: After 20 years in the regular classroom, I had an opportunity to teach K-5 science...something new! This change needed me to rethink everything about how to teach science and what I heard from so many teachers was how they hated teaching science. It was too much prep or they didn't know the information...lots of excuses, so how do we make science fun? I wanted to motivate myself by creating a blog and making products for myself and others to make it something that everyone could do. So...something catchy and where kids like to "play"...so the Science School Yard was created! Thanks for sharing your post. I, like you, LOVE teaching science. This is the first year in my 20 year career that I haven't taught Science, and I really miss it. I'll have to check out Outlander. I'm guessing its on Netflix. It used to love the classic Outlander movie (not sure if its related). Enjoy your break and good luck with your projects! Found you from Farley's Currently link up. My husband was just telling me the other day that we needed to find another show to watch, meaning we need a MARATHON weekend of watching! Our favorite shows have ended...Dexter, True Blood. My Spring Break just started this afternoon and I can't wait to just relax and do what I want. I, too, usually have BIG plans of things to get accomplished during this time but always end up not getting most things done...and I'm fine with that! haha! Enjoy the rest of your break! Woot! A fellow Renee with the accent over the 2nd e! Love your science ideas and I'll definitely be back to check out more! Enjoy your Spring Break & Easter! I love that you said your were just laying around - teachers need to do that more often! I love Science too! You have my ultimate job, I would love to teach the wonder of Science all day every day!